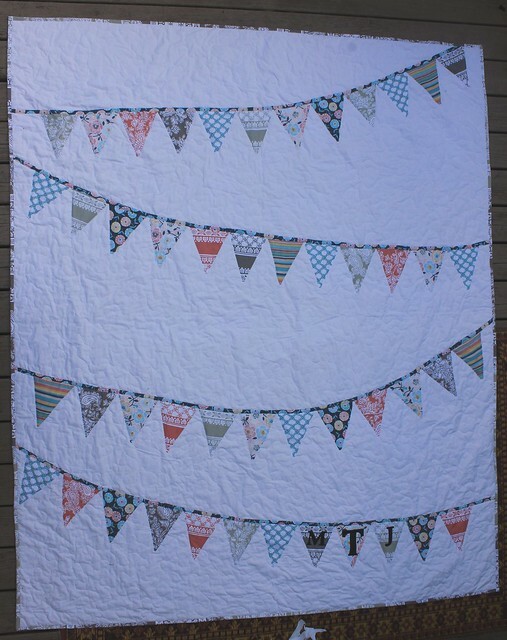 Do you know who made the first bunting quilt? I’d like to know! I feel like they just sort of popped up all over the internet at once about 5 years ago, but surely someone thought of the first one. Well, that person wasn’t me, but I have made a fair few of them in my time and I’d love to give the original person the credit! 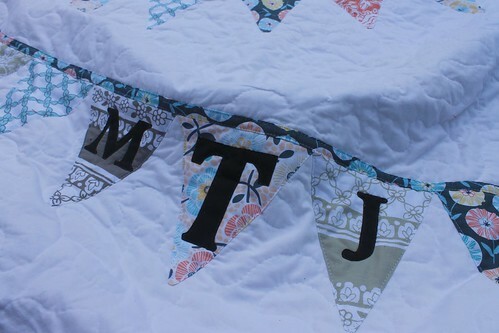 They are just perfect for weddings and baby gifts! Here is the latest. 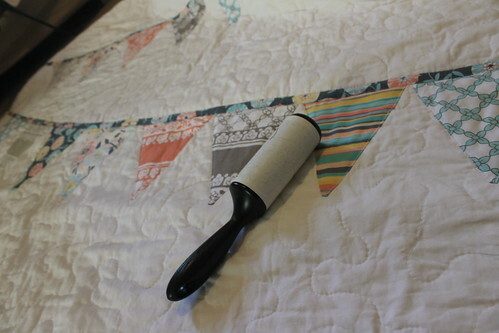 I also wanted to share a bit on my process of making bunting flag quilts – not so much a tutorial, more of some tips and tricks. I actually layer, baste and quilt the whole thing BEFORE adding the flags. 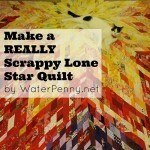 I use a sheet for larger quilts so I can get a solid background with no interrupting seams. 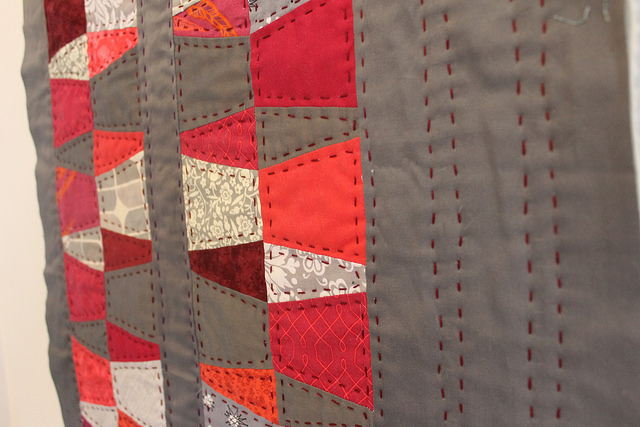 So for this quilt, I was just basting two totally blank sheets together! It’s very odd looking, but I think it is faster than quilting around the flags once they are sewn down and creates a nicer effect. I use an all over meander, though a grid would also look really nice, and I have done that before. It is a real challenge to get the grid to be perfectly even with no squares to go by! Then I cut out all the flags and iron the edges under – I don’t do raw edge applique with them. 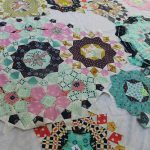 I use a bias trim maker to make the ribbon – a half inch wide – and then lay out the ribbon, criss-crossing it across the quilt till I like the lay out. then I lay down my flags and pin them into place. 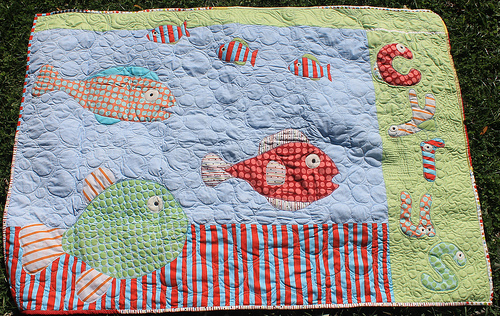 I quilt along the ribbon top and bottom and then around the flags. 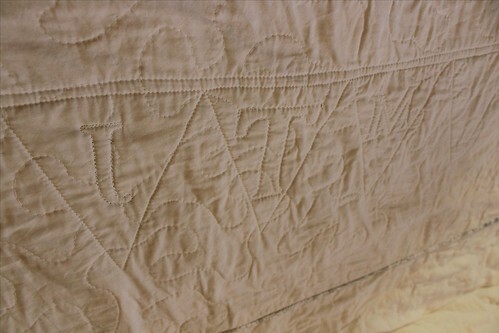 This quilt also had a monogram added – I do this last- and I do use raw edge applique, and you can see on the back where the letters are. 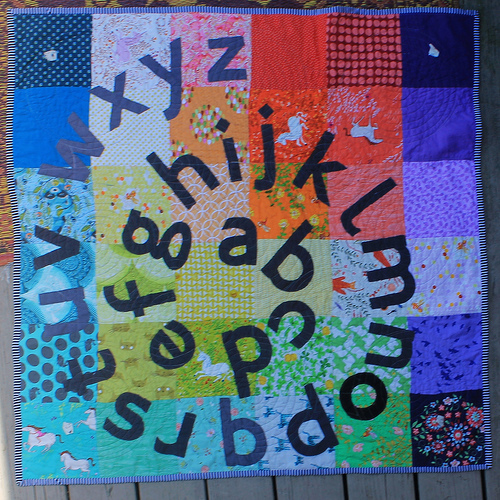 I don’t love the look of the backwards letters on the back of the quilt but I think it’s so much nicer to have the letters quilted and outlined. Finally, no quilt is ready till it’s lint rolled! It’s not glamorous, but it does make a quilt look so much nicer! And a last picture of the binding. I used the Whispers by Michael Miller line and it has these lovely just off shades of clay. They look great together on the binding. 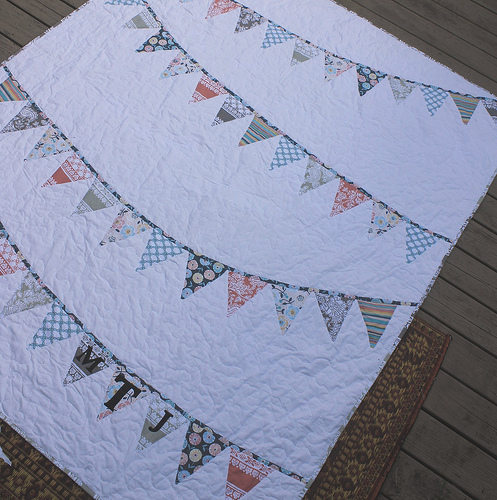 This line is just perfect for a wedding quilt that will translate well into day to day life around the house I think.